CARA was founded in 1913 and has remained active except when radio silence was mandated by the government during World War I and II. During the Korean conflict, members passed messages to those serving in the armed forces overseas. We have mobilized during times of distress, such as the flood of 1998. The group also prides itself in frequent service for local public events such as the Cambridge Holiday Parade, an event we have been working since 1979. Our meetings are at the Guernsey County Administration Building located at 627 Wheeling Ave, Cambridge. Regular business meetings are still held at 10 am on the last Saturday of the month. Please note, the GCARES meeting has been moved to the first Monday of the month at 6:30 pm. Please check the calendar for more information. Come along for a look back to the beginning of wireless communications in Guernsey County from spark gap transmitters to today’s solid-state all-mode transceivers. 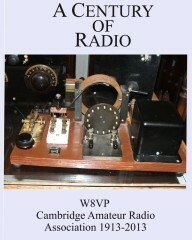 The book follows the journey of CARA members through the years along with photos of events, members, and their QSL cards. We would like to congratulate KA8NZS and the book committee for bringing us an in-depth look back at the 100 years of CARA. The club would also like to extend a special thank-you to W8SU for his contributions as well. The book may be ordered online through Amazon. You may also order a book by contacting KA8NZS or KD8MSL. We will be ordering apparel and need a minimum of 10 items. 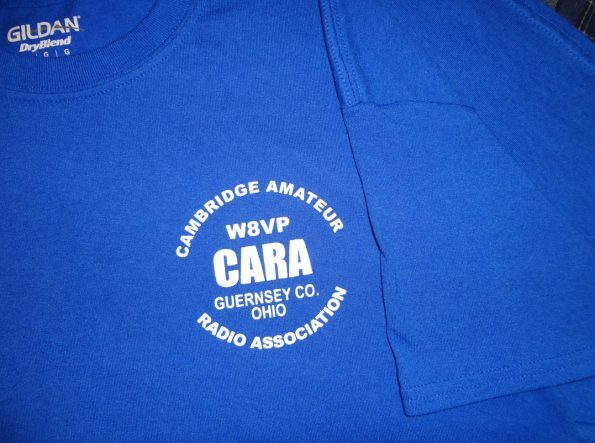 Garments will come as CARA Blue with white lettering, or if you wish, blue lettering on white. For more information, or to place an order, contact KD8MSL. Mr. Adair, a local historian, has generously volunteered to host the building on his property. Mr. Adair’s Railroad Empire located just East of Cambridge on US Route 40. The building will remain property of the club. We were able to, with the help of generous donors and through fundraising events, raise enough money to have the station moved. Since then, the building was repainted and with a ramp built for better accessibility. There’s still work yet to be done to the building, but we are glad to preserve a piece of radio history.